FORECASTING is based on a collection of amateur videos taken from the world’s largest video-sharing website: YouTube. 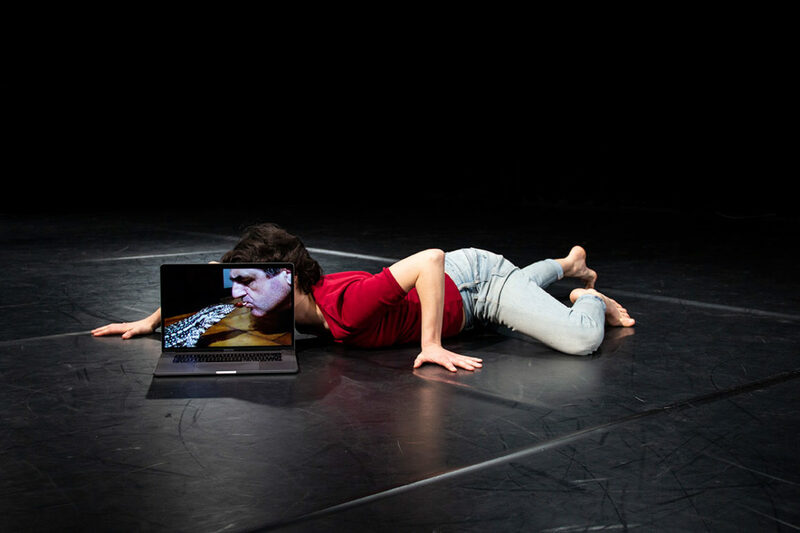 On stage, a performer skillfully manipulates a laptop, which shows videos selected to correspond to a human scale. The screen becomes the site of intersection between the body of the performer and the two-dimensional world of images that represent other people in other places. The result is a dizzying hybrid experience, blurring the lines between the banality of everyday situations and new modes of narration. FORECASTING received the Special Jury Prize at the 56th International Theatre Festival MESS in Sarajevo, in October 2016. Barbara Matijevic was born in Nasice (Croatia) in 1978. She studied Literature at the Faculty of Arts in Zagreb and Dance at the Hypaxis Dance Centre (N.H./U.S.A.) and the International Centre for Contemporary Dance and Performance Art – ATHENA, under the artistic direction of Kilina Cremona in Zagreb. She has worked amongst others with Bruno Marin and David Hernandez. She also collaborated with Boris Charmatz in the project Bocal, and worked as Jan Fabre’s assistant. She taught Dance at the National Conservatory of Dramatic Art in Osijek (Croatia). She has been collaborating with Giuseppe Chico since 2008. Giuseppe Chico was born in Bari (Italy) in 1974. He studied Ancient Languages and started working in Theatre at an early age with the Abeliano Company under the direction of Tina Tempesta and later with Kismet Theatre, under Robert McNeer. After studying Theatre in Rome and Milan, he moved to Paris in 2000 and began to train in contemporary dance. He was a performer for several years for the company Mille Plateaux Associ.s. He also worked with George Appaix and Joris Lacoste.